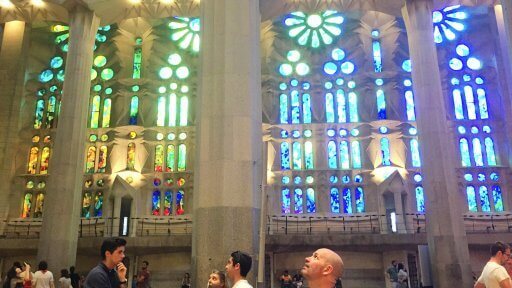 I remember the first time we went to Barcelona. 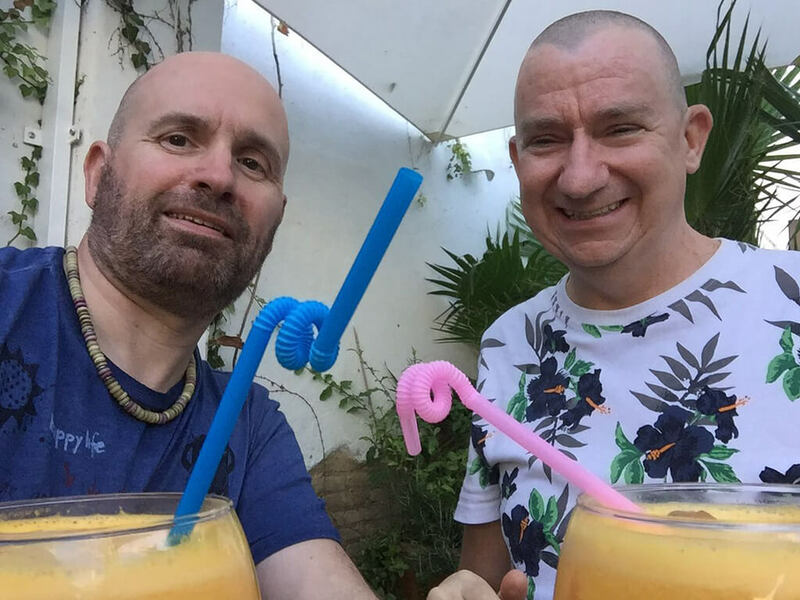 Bart & I were celebrating our first anniversary with a holiday to Sitges. 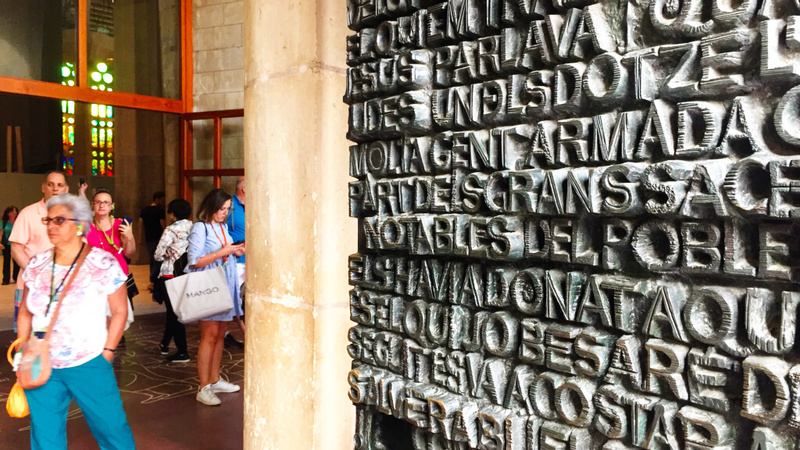 We took the train to Barcelona for a day trip. After arriving in the city, we hopped on a Barcelona Tour bus to try to get a feel for the place. 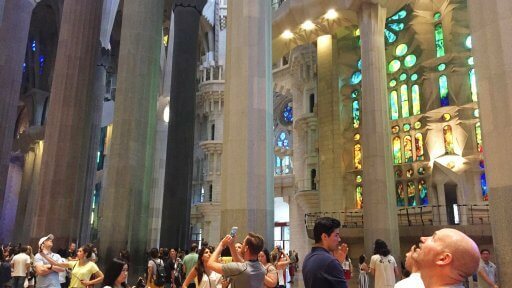 I remember being wowed as the bus drew close to the Sagrada Família and I saw the amazing building for the first time. We fell a little bit in love with Barcelona on that day trip and we have returned to the city again and again. Sometimes we just visited for a couple of days and other times we spent a couple of weeks exploring it. The first time we stayed in the city was in 2000 and it was then we first set foot inside the Sagrada Família. Over the years, we popped back to take a look at how the building was progressing, However, we only went inside just once more, 8 years after our first visit. So, we decide that it was time to pay it another visit and see how it had changed inside. The construction of the Sagrada Família began in 1882. 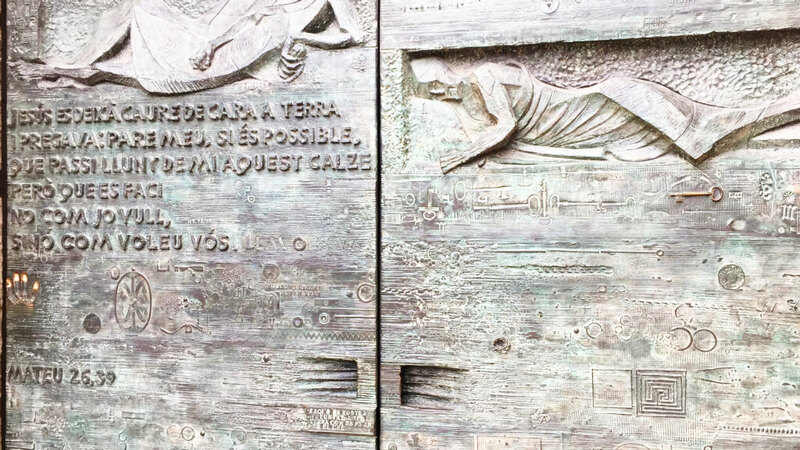 A visit to the Vatican in 1872 inspired Josep Maria Bocabella to build the church. 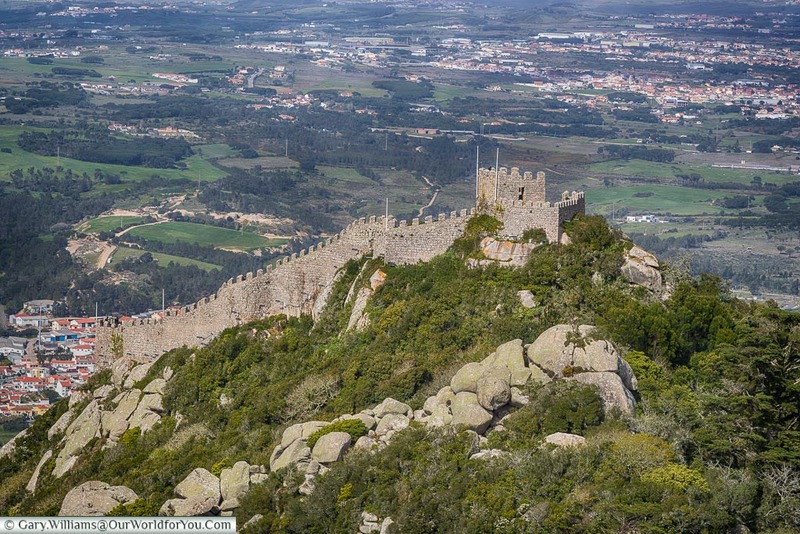 Bocabella raised some money to start construction and appointed Francisco de Paula del Villar as architect. His plans for the basilica were a Gothic Revival design. The crypt for this design was completed in 1883, but after arguments with Bocabella, Paula de Villar resigned. 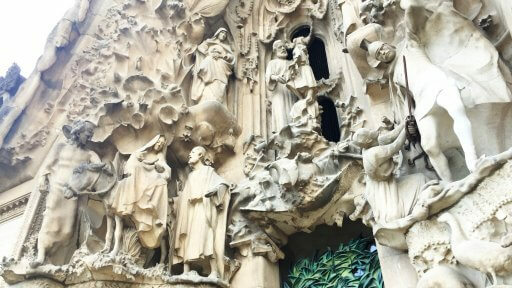 Gaudi was officially appointed architect in 1884. 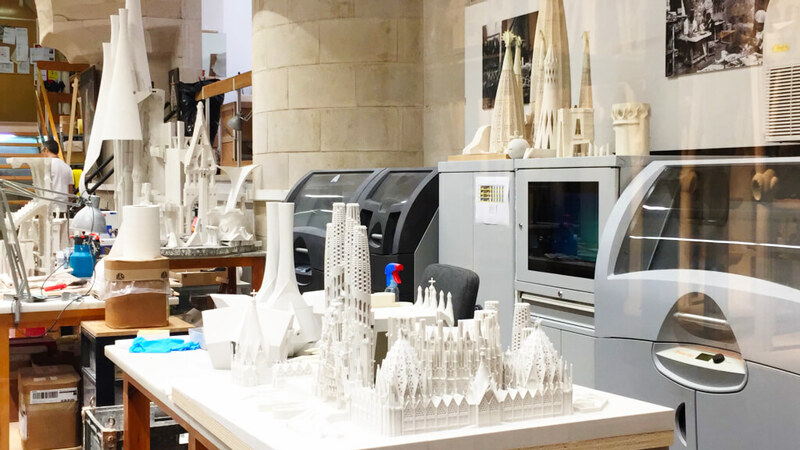 If you visit the Sagrada Familia and visit the museum, you can see scale models of the various designs for the basilica. You can see that Gaudí’s first design was much more like Paula de Villar’s original Gothic design. 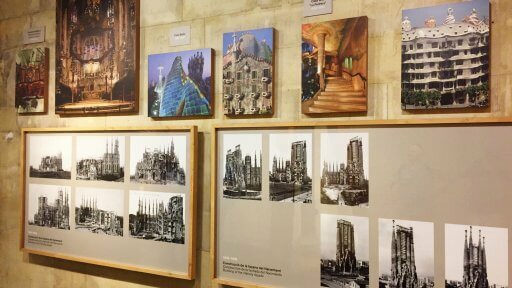 Over a few years, Gaudí changed the design several times before coming up with the design that is still being followed. Gaudí was raised a Catholic and became increasingly religious as he became older. He also became more obsessed with the building of the Sagrada Família. He gradually took on less other work. In 1910, he moved into a room in the basement of the basilica. 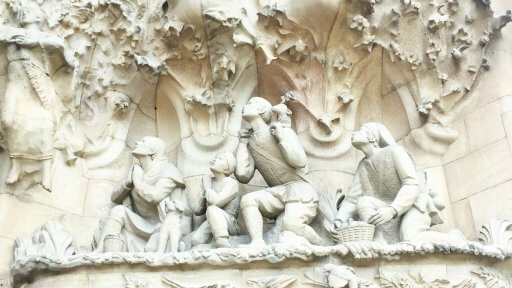 At this point, Gaudí began to change his lifestyle and eating habits. From being a well-groomed dandy who dined extravagantly, in later life he was often unkempt, wore old shabby suits and ate frugally. 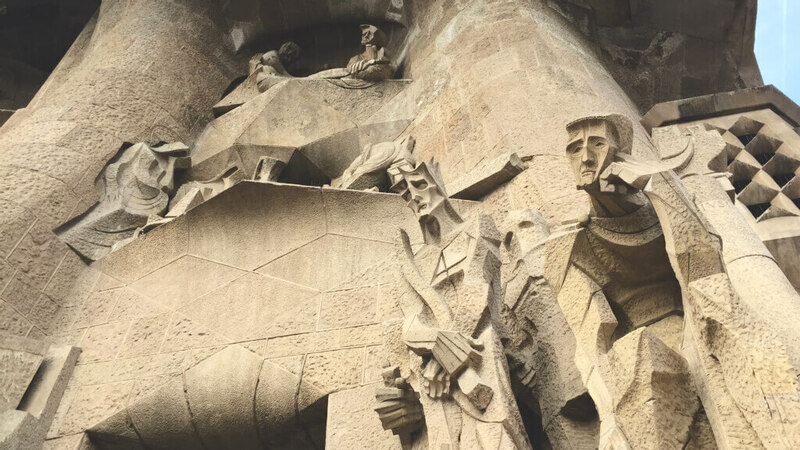 From 1915, he dropped all other work and devoted himself entirely to the Sagrada Família. The building of the basilica was entirely funded by donation. The availability of funding dictated the speed of the build. When Gaudí was killed in 1926, the construction was about 15 to 20 percent complete. 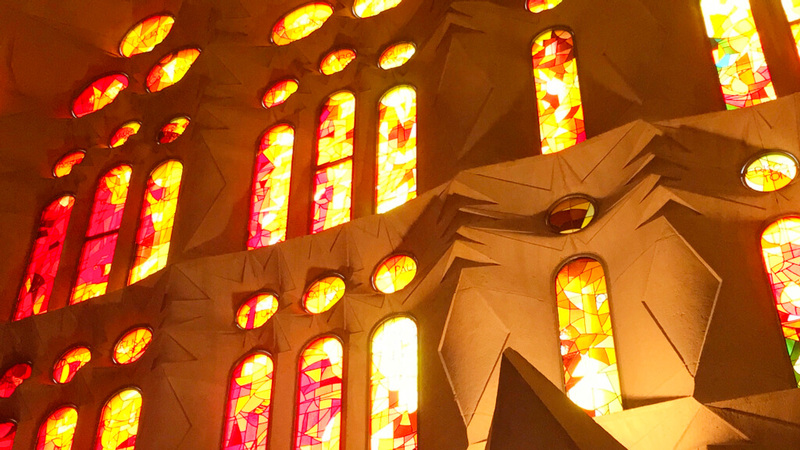 At one time, Gaudí was asked about the speed of the building work, he is said to have replied: “my client is not in a hurry”. After Gaudí’s death, work continued at a slow pace until 1936, when construction was halted by the Spanish Civil War. 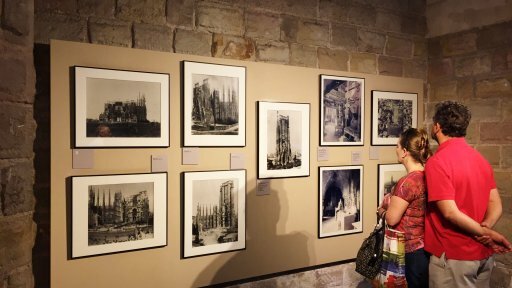 During the civil war, parts of the basilica and Gaudí’s models and plans were destroyed by anarchists. As a result, the current construction work is all based on partial plans and recovered sketches and notes. The construction work is now mainly funded by the proceeds of the visitor ticket sales. On our first visit back in 2000, the basilica had no roof and we were walking around on duckboards. By our second visit in 2010, the roof had just been completed, the duckboards had been replaced by gravel and they had begun to lay the floor. We were looking forward to seeing the changes since 2010. For this visit we decided to opt for a guided tour. 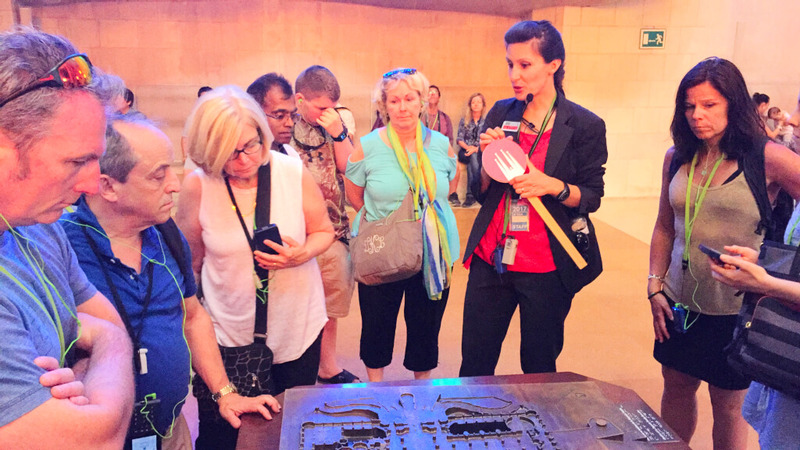 The guided tours tend to sell out in advance, so it’s worth planning ahead. 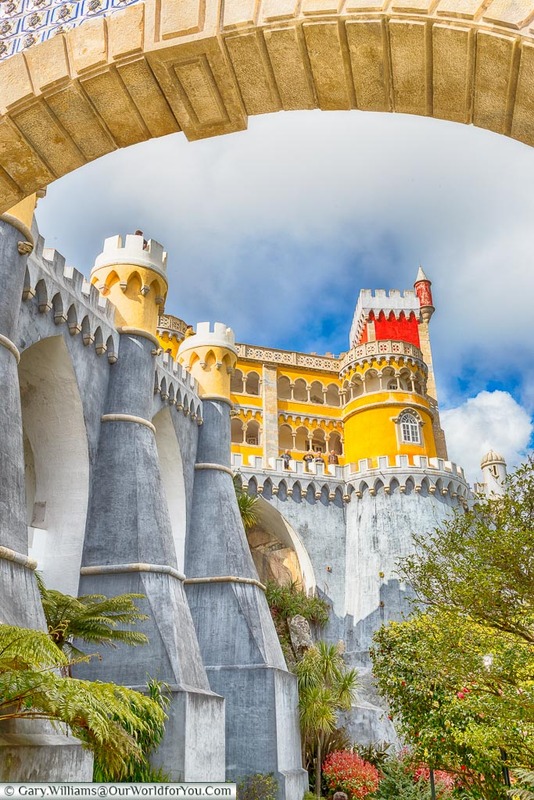 You can buy tickets online and both AttractionTix and Viator sell the tour tickets, along with fast track entry tickets and small group private tours. 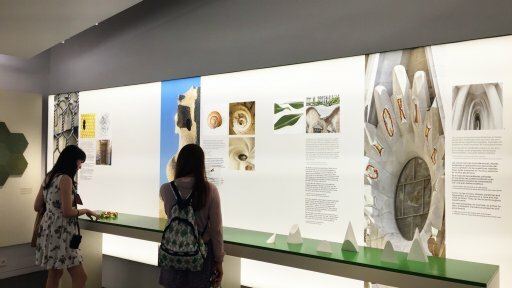 Even if you don’t want to take a guided tour, it’s still worth booking ahead as you could well end up queuing for up to 3 hours just to buy a ticket. On the ticket, it advises you to arrive 15 minutes ahead of the tour. That will give you plenty of time to go through security, find the meeting point and get your headset sorted. Just due to the sheer volume of visitors, the bag checks can take a while, especially if you get stuck behind a couple of backpackers. 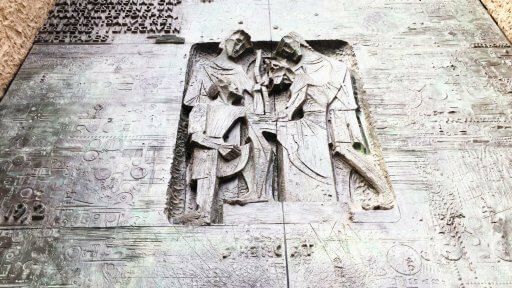 The guided tours begin outside the Nativity door. Our guide began with a bit of background on the construction, before going into details about the carvings around the door. 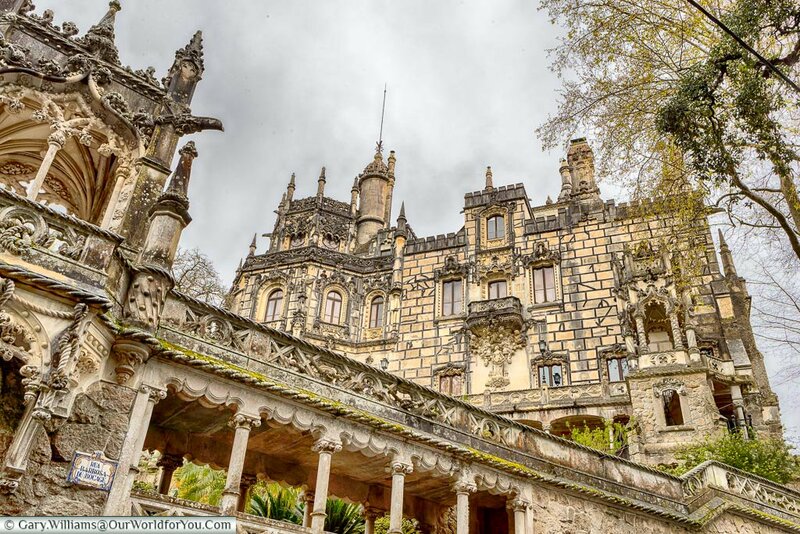 The carvings are ornate, with intricate designs of plants. 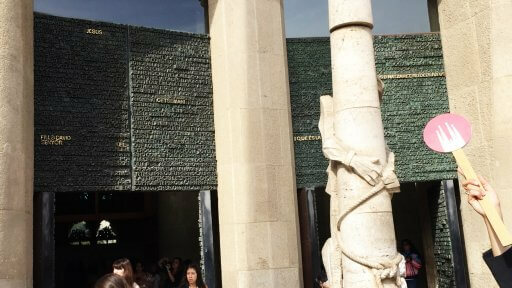 The pillars on either side of the doors of the Nativity façade rest on the backs of giant turtles. 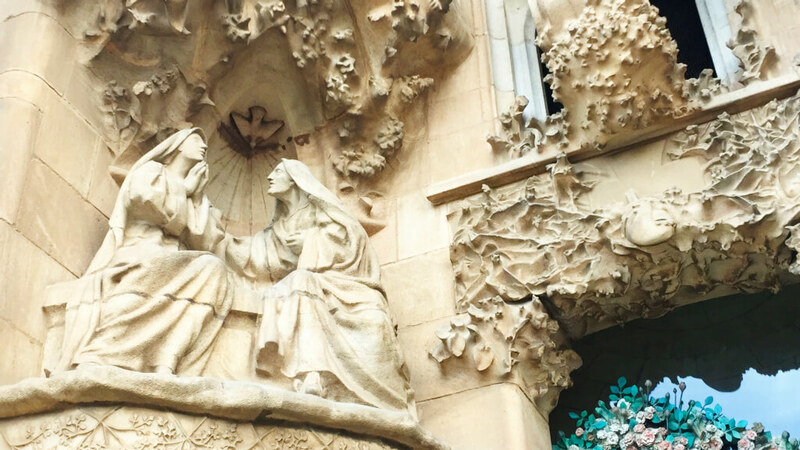 The Nativity façade was, for the most part, completed in 1905 and Gaudí was directly involved in its building. 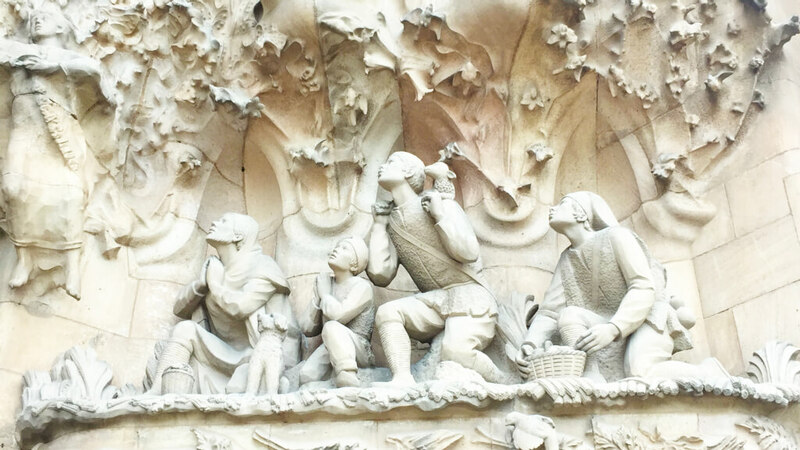 The Nativity sculptures are exuberant and lively, depicting a celebration of the birth of Christ and a celebration of nature. After the explanations about the Nativity carvings, we began to make our way towards the door. 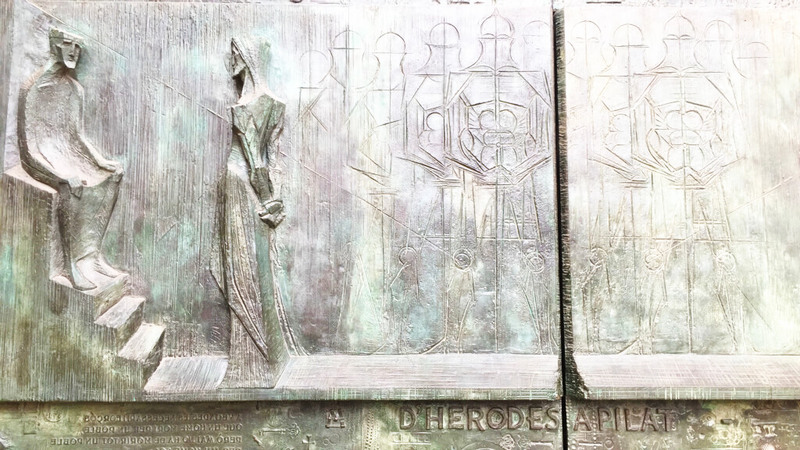 In the lobby area between the outer doors and the entrance to the body of the basilica, our guide paused. Her advice to us was to take a deep breath before walking through the next set of doors. 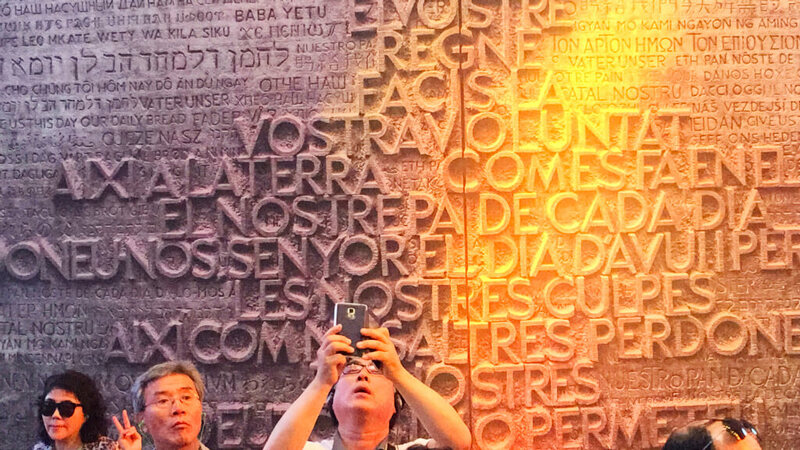 I find it quite hard to come up with words to convey my feelings on walking into the main body of the Sagrada Família. It’s actually a little overwhelming but definitely a “wow” moment. The first thing that strikes you is the scale of the building. There is no way to deny that it is huge. 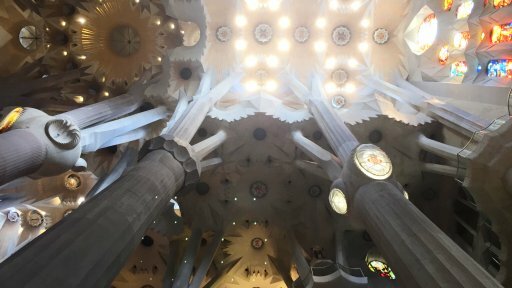 Then there are the magnificent columns, rising like tree trunks and branching to support the ceiling. 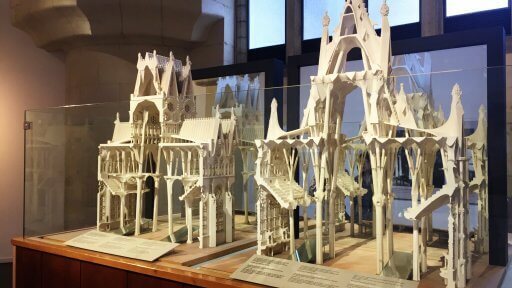 When you look at them, they seem to be too delicate to support the load of the roof. That is another example of Gaudí’s design genius. 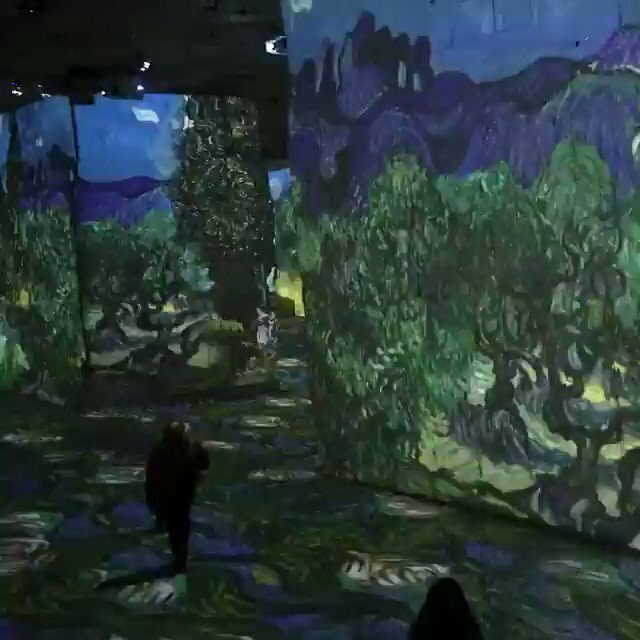 There are more “wows” as you walk around. 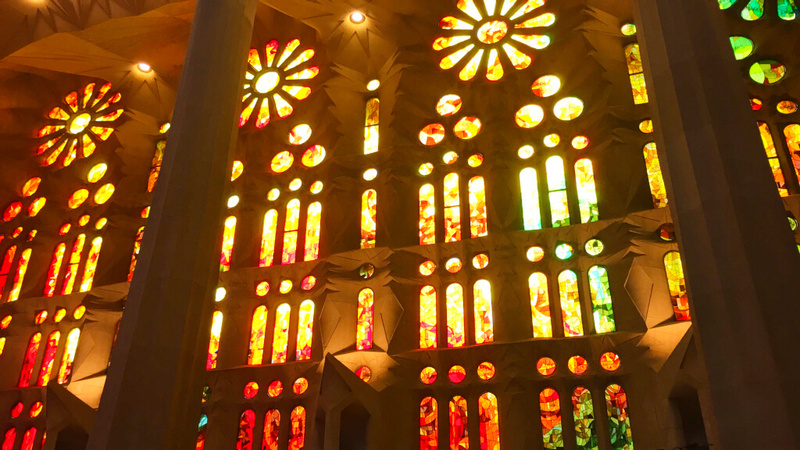 The stained glass, with the light shining through, casts a glow over the inside. The mood and colour of the glow changes throughout the day as the sun moves and strikes different parts of the glass. As you look up you can see the raised choir loft that surrounds the nave of the basilica. 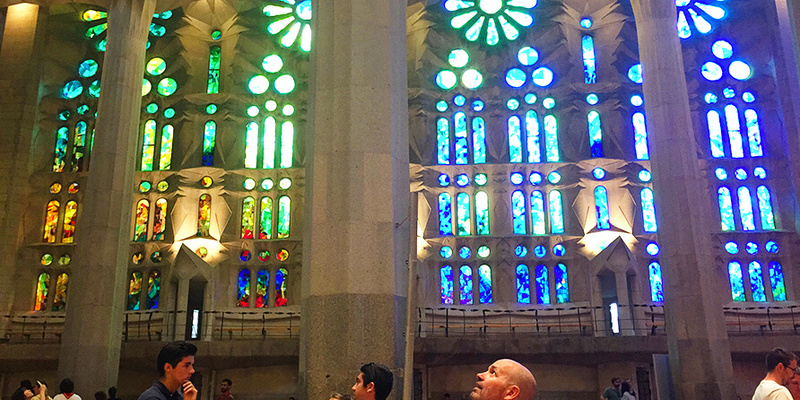 The choir loft can hold 1,200 choristers. I can’t even begin to imagine what that would sound like. I can only think it would feel more like being bathed in sound than just listening to music. 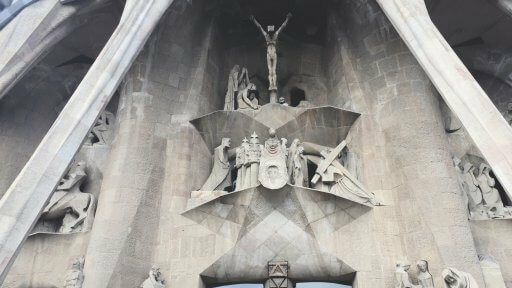 At the opposite end of the basilica to the crucifix is the Glory door. 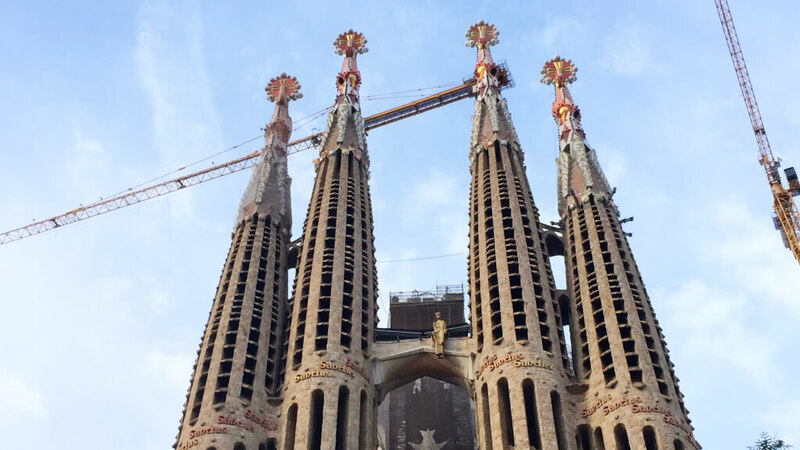 Construction of the Glory façade only started in 2002. Eventually, this will be the basilica’s main entrance. 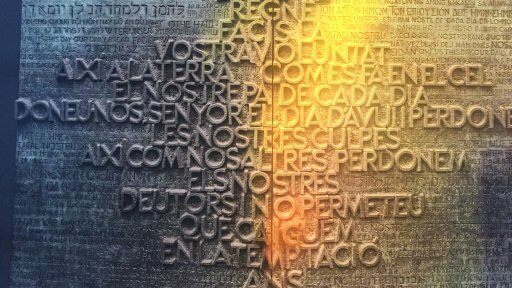 Currently, you can see a reproduction of the door, which carries “The Lord’s Prayer” in 50 languages, the most prominent being Catalan. When the Glory entrance is complete, you will access the Sagrada Família via huge stairs and a bridge that runs over the road. This was always part of the plan, though when the work on the basilica started, the road didn’t exist. Neither did the buildings that surround Sagrada Família. When construction started, the site was surrounded by fields. However, the land around it is now built up. 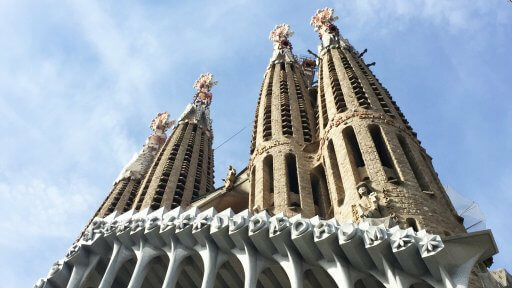 Ultimately, in order to realise Gaudí’s design for the main entrance, the building opposite will need to be demolished. 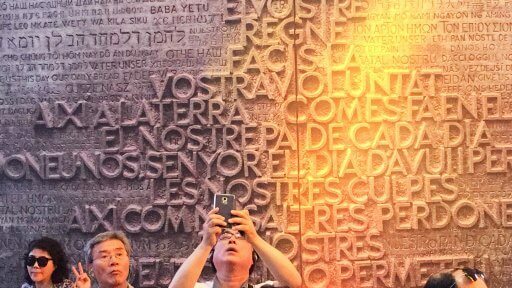 Having spent some time exploring the inside, our guide led us outside through the Passion door. It is on the opposite side of the Nativity door in so many ways. 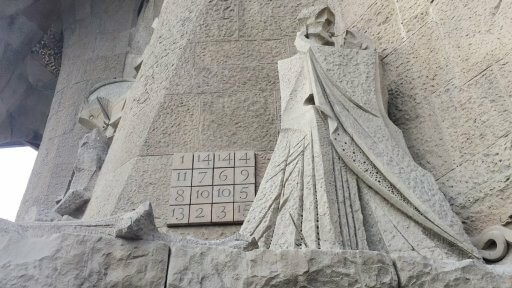 Physically it is on the opposite side of the Sagrada Família. It depicts the opposite end of Christ’s life. 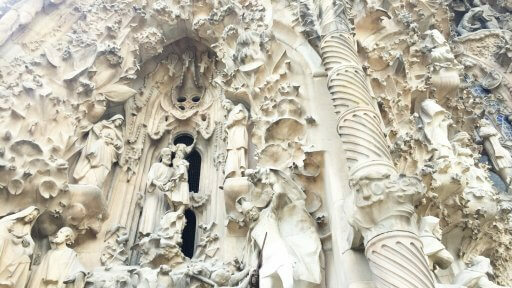 Stylistically, it is the total opposite of the ornate Nativity entrance. While the Nativity façade is rich with ornate designs taken from nature, the Passion is largely plain. The soft and gentle lines of the Nativity statues are replaced with the hard and angular sculptures that depict the stations of the cross. My reaction to the Passion was a very different “wow” to that of the Nativity. Gaudí knew that his designs for the Passion façade would be controversial. In fact, he delayed the start of work on it. When construction began, it was met with protests in the streets. The Passion façade provokes a very different feeling than the Nativity. It still has a certain beauty, but it also feels cold and brutal. From the Passion door, our guide led us into the exhibition centre. This houses models, some of the remaining original plans and some of Gaudí’s prototypes for parts of the basilica. It also houses the small room that Gaudí used as his home for the last years of his life. 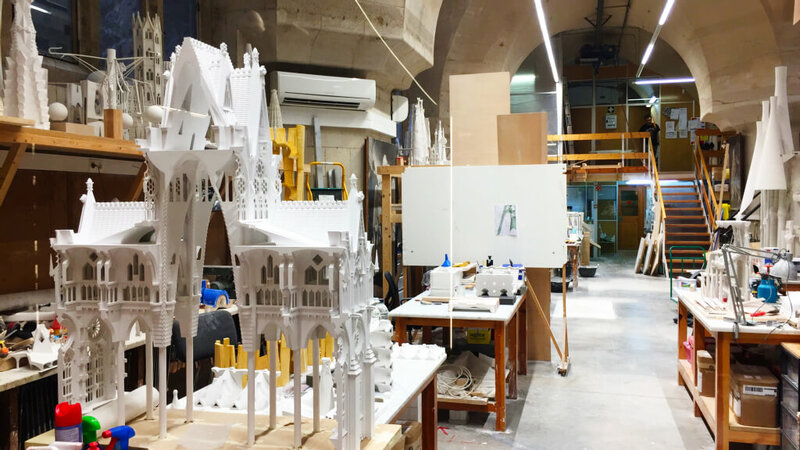 The workshops are off the side of the exhibition centre and in here you can see some of the craftsmen working on pieces for the basilica. 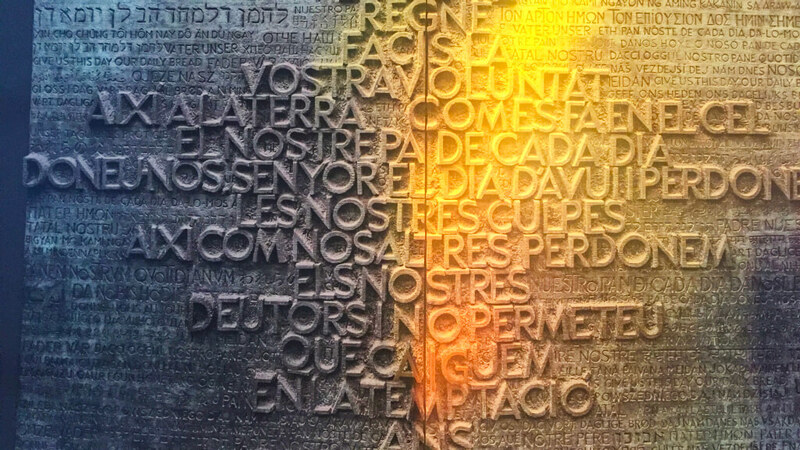 This, together with construction noise as you walk around, reminds you that Sagrada Família is still a building site. We walked through the exhibition until we reached a wall with some windows. These overlook the crypt. 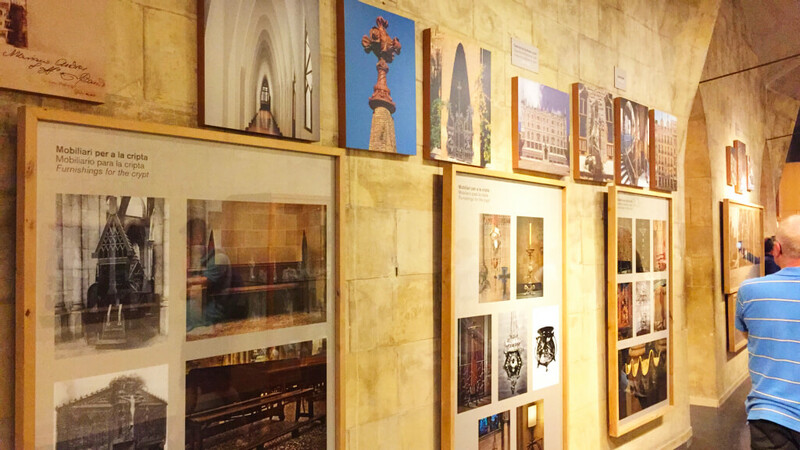 Gaudí made only minimal changes to the crypt after he took over as the architect. 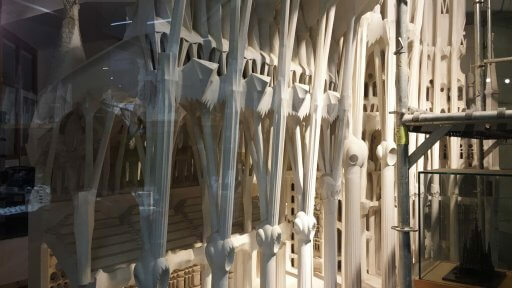 As a result, the crypt still shows Paula del Villar’s Gothic designs. As we gathered around near the crypt windows, our guide told us about Gaudí’s sad death. On 7 June 1926, Gaudí was walking to the Sant Felip Neri church for his daily prayer session. 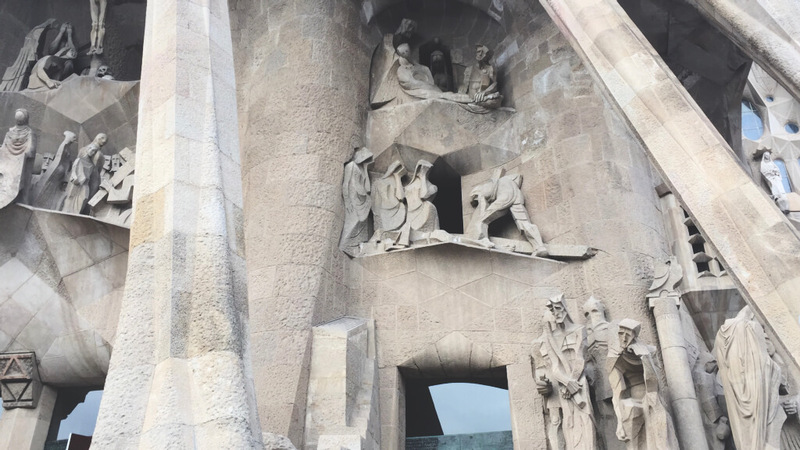 As he walked along the Gran Via de les Corts Catalanes, he was struck by a tram. He was dressed in his shabby working clothes and had no documents on him, so he was assumed to be a tramp. He lay in the road for a while until some passers-by took him to hospital by taxi. At the hospital, he received only minimal care and by the time he was recognised, it was too late to save him. 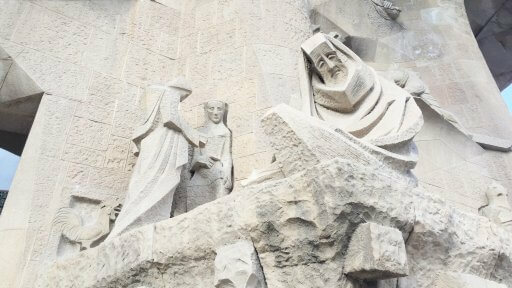 Gaudí died on 10 June 1926 at the age of 73. He was buried in the crypt of the Sagrada Família, alongside Josep Maria Bocabella, the basilica’s founder. 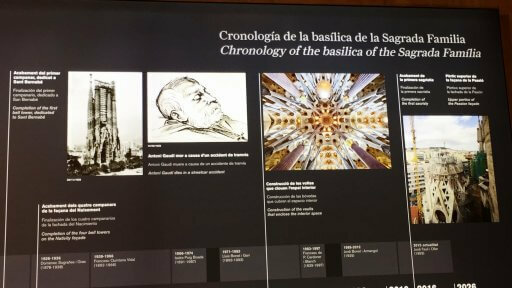 Our tour had finished and now we could go around and explore the basilica on our own. The tour had lasted nearly 90 minutes and we spent almost that long just wandering around and taking photos. Our 2010 visit had taken place just after the roof had been put on. A few months after that visit, the church was consecrated by Pope Benedict XVI. The Sagrada Família can now be used for religious services. 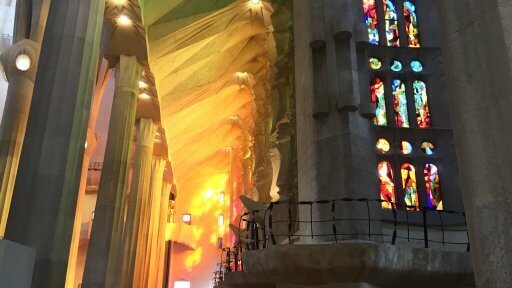 (Although, as of 2017 there is no regular programme of worship there). 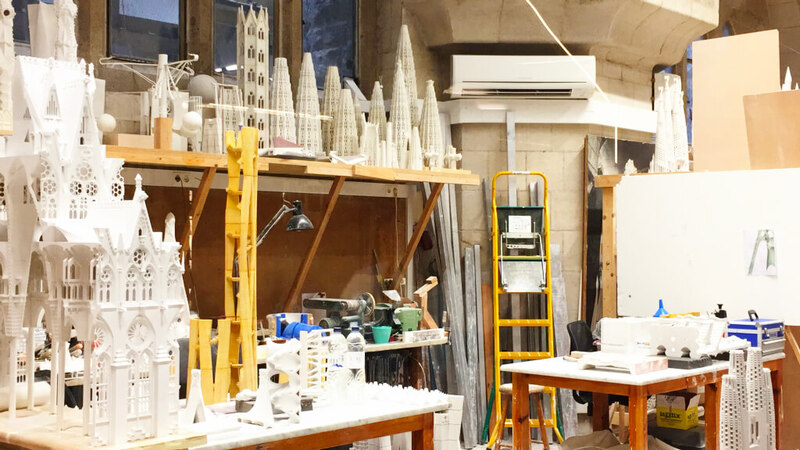 Some people believed that The Sagrada Família would never be completed. However, with increasing numbers of visitors, the money has rolled in more quickly, meaning that the speed of construction has picked up. They aim to finish construction by June 2026. This will coincide with the 100th anniversary of Gaudí’s death. I don’t think that there could be a more fitting tribute to the man than to see the basilica that he devoted 43 years of his life to finally complete. 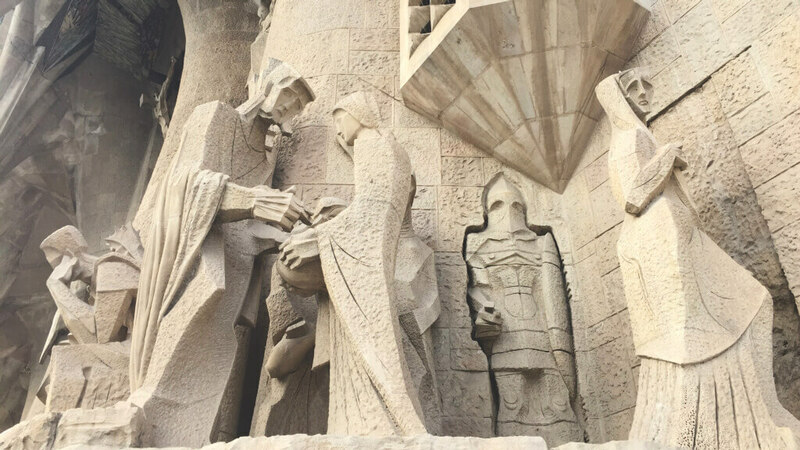 The building work at the Sagrada Familia is funded entirely by donation and revenue from visitors. If you visit Barcelona, make time to go to see it. You can stand outside and look through the fence, but the best of it is inside. 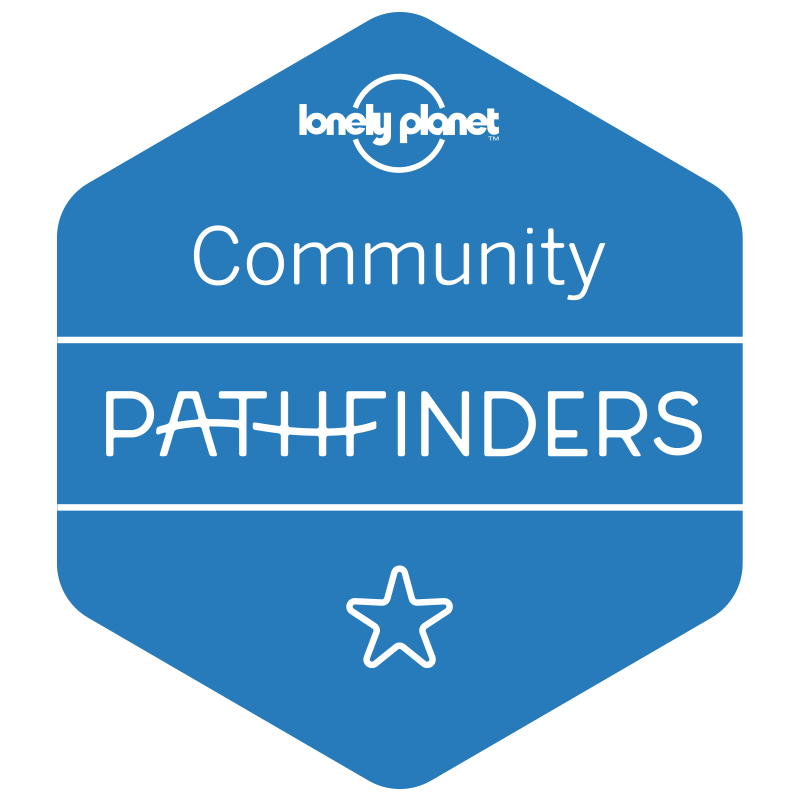 By buying a ticket, you’re helping to bring the building that much closer to completion. If we don’t go back there before, we’re looking forward to visiting in 2026 to see Gaudí’s vision complete. 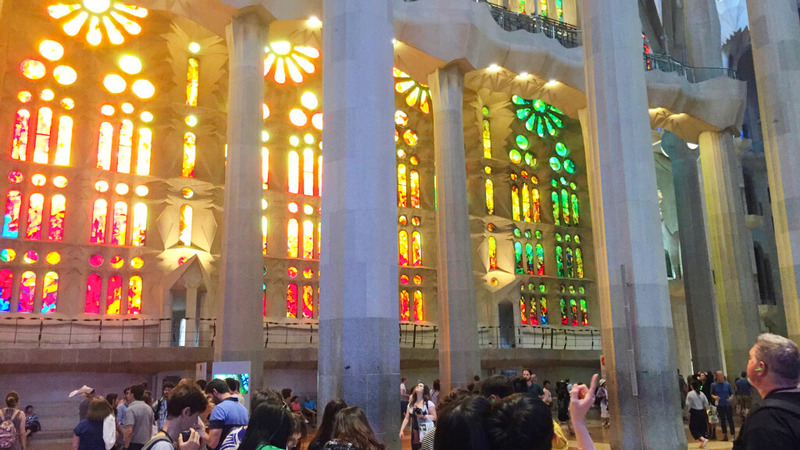 If you visit Barcelona, go to see the Sagrada Família. Your ticket will help to pay for the building work. 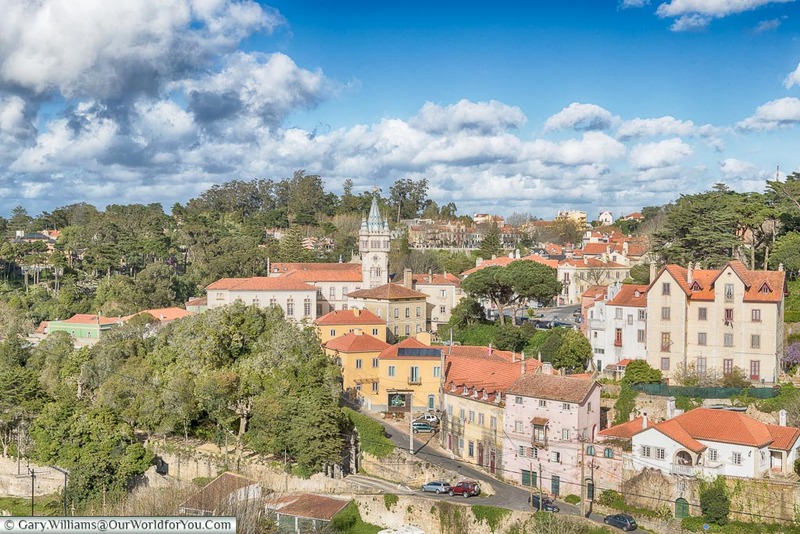 NextTravel insurance – can you afford to travel without it? 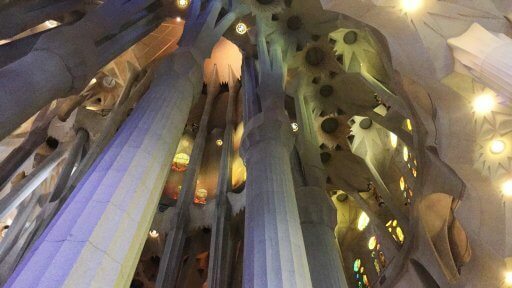 I’m impressed with Gaudi’s work. 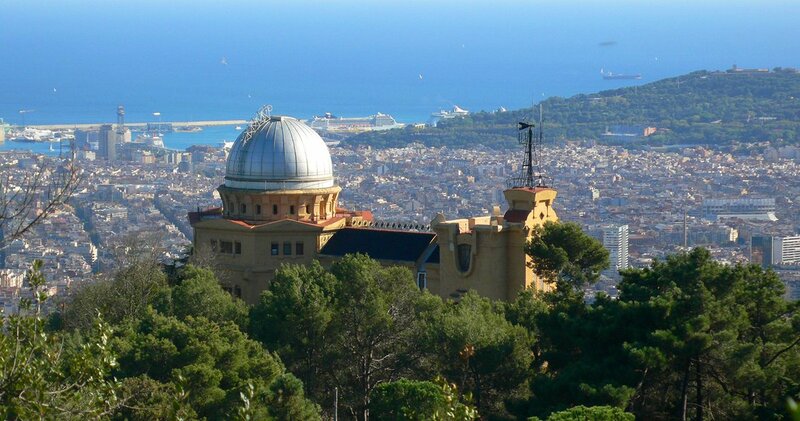 Self funded buildings are really difficult to maintained but this looks like a gem of Barcelona! It is definitely as fantastic as I have tried to make it sound. The self-funding has made the build slow, but the more people that visit, the more chance of it getting finished by 2016.